A common comment about macro photography is that you’re more likely to work at an aperture of f8 than f2.8. In other words, when working at very close distances, the depth of field can get really small and it is sometimes required to close the aperture to increase the DOF. Not all rules must be followed however, especially in photography. What is really the outcome of playing with the aperture when doing close-ups? What effects can be achieved with a shallow or deep DOF? This short article aims at giving examples of the trade-offs of using wide or small apertures when doing macro photography. Two goals are usually aimed for when shooting macro: subject details and subject isolation. Details are achieved by focusing accurately and making sure enough of the subject is in focus. Subject isolation is achieved by making sure the background is blurred and the bokeh smooth. The four pictures presented below were shot with the same lens (a dedicated macro lens), with the camera placed on a tripod. Only the aperture (and thus the exposure time) was varied, going from wide (f2,8) to moderately small (f7,1). The first picture, at f2,8, shows an extremely smooth background. There is no doubt here that subject isolation is effective. The background is completely blurred. 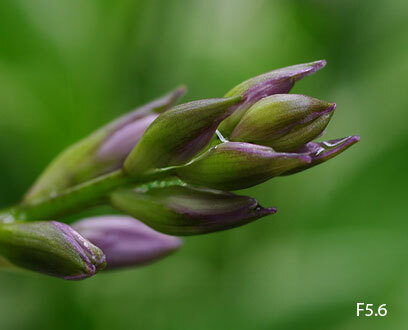 However, only a small portion of the budding flower is in focus. What’s more, the actual focus point does not seem to be at the very tip of the flower, but a little behind it. Part of the bud at the bottom left is also in focus, as an afterthought. The result is that the eyes fail to find an anchor point. The image at f7,1 is opposite. The whole subject is sharp and detailed. However, the background is busier, with visible patterns that can distract the viewer. The image at f5,6 shows the same distracting background, to a lesser extent. The result is a more pleasing, more balanced image. The picture at f4 shows both a very effective subject isolation, and satisfying details. The background is almost free of patterns and lines which would distract the viewer, but the level of details on the flower is high enough to provide an anchor. The whole tip off the flower is sharp, and the stem transitions smoothly into an out-of-focus blur. It is probably the most balanced picture of the four. These four examples illustrate that there is no firmly set rule for macro photography (and for photography in general)! The photographer should always adapt the camera settings to the scene in front of him. With digital, it is easy to experiment and explore many possibilities. Smooth background; small portion of flower in focus. Subject sharp and detailed; busy background. Some distracting background but more balanced image. Effective subject isolation, and satisfying details. Throwing the background out of focus is desirable when taking macro shots.